This is a lively, freshly invited collection of papers by a number of well-known philosophers and other specialists who have focused very pointedly on certain central conceptual puzzles posed by the general practice of interpretation in the arts, literature, history, and the natural and human sciences. The collection gives very nearly the impression of a sustained debate. 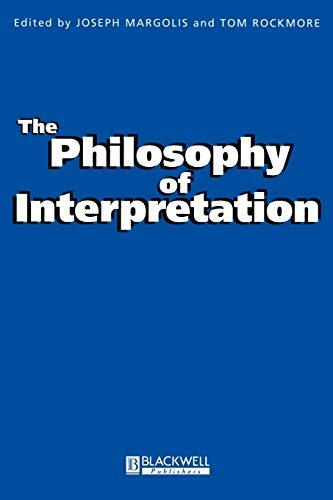 This is a collection of freshly invited papers by a number of well-known philosophers and theorists attracted to the puzzles of interpretation in the sciences, history, literature, and the arts. Interpretation is usually viewed as a specialized discipline in one or another domain-sacred texts, law and political constitutions, poetry and painting and music. But notably since the French Revolution and the rise of post-Kantian philosophy, culminating in Hegel, interpretation has come into its own as a distinctive problematic bearing on the theory of reality and the conditions for the objective characterization of different parts of the world. It is now noticeably difficult to separate the specialized interpretive work of one or another discipline from larger reflections on interpretation's role in our account of knowledge and reality themselves. The papers here collected have isolated and pursued the most salient puzzles of what now forms the theory of interpretation. John R. Shook is Vice President for Research and Senior Research Fellow at the Center for Inquiry, and Research Associate in Philosophy at the University at Buffalo. He is author of Dewey's Empirical Theory of Knowledge and Reality, editor of Pragmatic Naturalism and Realism, and editor of the Dictionary of Modern American Philosophers. He is also co-editor of the journal Contemporary Pragmatism. Joseph Margolis is Laura H. Carnell Professor of Philosophy at Temple University. His recent books include The Flux of History and the Flux of Science, Historied Thought, Constructed World: A Conceptual Primer for the Turn of the Millennium, Interpretation Radical but Not Unruly: The New Puzzle of the Arts and History, and Reinventing Pragmatism: American Philosophy at the End of the Twentieth Century.